The only Yuletide favourite to pivot around an attempted suicide, Capra’s post-war fable is a fascinating melange of social and personal impulses and the questionable charms of home. 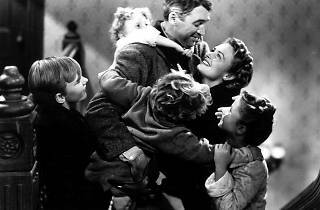 James Stewart is impeccable as George Bailey, the Bedford Falls boy-next-door whose dreams are continually deferred by the demands of family and national upset: rather than exploring and building new worlds, he runs a building society, marries and raises children. 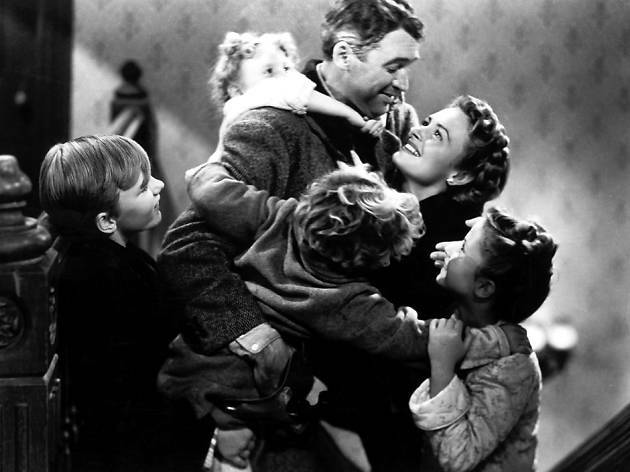 Mapping his frustrations and joys onto the contours of recent US history, ‘It’s a Wonderful Life’ puts individual and group interests in tension. Denied the opportunities for individualist enterprise that are the stock in trade of American cinematic heroism, George is pulled towards communal effort and self-effacement. Yet the film’s bravura fantasy sequence, imagining the hellishly licentious Bedford Falls that would exist without George, makes the grandest possible case for the importance and uniqueness of individual agency – ‘Battleship Potemkin’ this ain’t. Funny, compelling and moving. One perfect Christmas movie to watch with friends and family. I was lucky to have seen it in the Union Chapel which took this movie to a different level, it's simply amazing! A holiday classic and deservedly so. The movie was heartwarming and illustrated the power of family, faith and community. It is, though, a bit unrealistic. Is anybody as sacrificial as Jimmy Stewart's George Bailey? Only Capra could make a fiction come to life AS he did in directing this movie ,He seemed to give a leading role to all the actors in a scene,And a laugh where it really dosent fit the role but works out to be funny.Will there ever be another Frank Capra ,I dont think so.,.Jc.